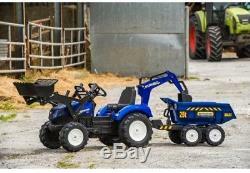 New Holland T8 Tractor with Front Loader, Backhoe and Trailer. 4 wheels large dumper trailer. New Holland decals and colour. Full asssembly required, hammer and screwdriver required. Assembled dimensions: 220L x 70W x 53H cm. Contents: 1 x New Holland tractor complete with front loader; rotating seat, fully articulated back hoe and a twin axle Dumper Maxi trailer. 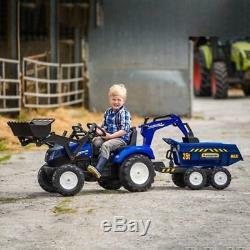 Your little farmer will be able to own their very own tractor from the Dutch global agricultural machinery company New Holland. The New Holland T8 pedal tractor with fully operational articulated backhoe, rotative seat, front loader and twin axle giant dumper trailer. This is compatible with all other Falk accessories. Our stock all ships from our UK based warehouses. Only factory defects are accepted as a reason for a return. In the case of factory defects, we will replace the product for you. We usually respond within 24 hours on weekdays. 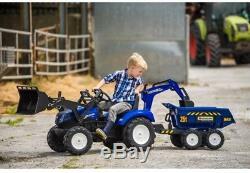 The item "New Holland T8 Tractor with Front Loader, Backhoe and Trailer" is in sale since Thursday, March 22, 2018. 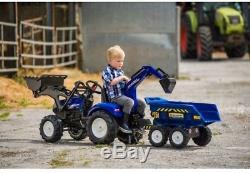 This item is in the category "Toys & Games\Diecast & Vehicles\Farm Vehicles\Contemporary Manufacture". The seller is "startwenty2" and is located in London. This item can be shipped to United Kingdom, Antigua and barbuda, Austria, Belgium, Bulgaria, Croatia, Cyprus, Czech republic, Denmark, Estonia, Finland, France, Germany, Greece, Hungary, Ireland, Italy, Latvia, Lithuania, Luxembourg, Malta, Netherlands, Poland, Portugal, Romania, Slovakia, Slovenia, Spain, Sweden, Australia, United States, Canada, Brazil, Japan, New Zealand, China, Israel, Hong Kong, Norway, Indonesia, Malaysia, Mexico, Singapore, South Korea, Switzerland, Taiwan, Thailand, Bangladesh, Belize, Bermuda, Bolivia, Barbados, Brunei darussalam, Cayman islands, Dominica, Ecuador, Egypt, Guernsey, Gibraltar, Guadeloupe, Grenada, French guiana, Iceland, Jersey, Jordan, Cambodia, Saint kitts and nevis, Saint lucia, Liechtenstein, Sri lanka, Macao, Monaco, Maldives, Montserrat, Martinique, Nicaragua, Oman, Pakistan, Peru, Paraguay, Reunion, Turks and caicos islands, Aruba, Saudi arabia, South africa, United arab emirates, Ukraine, Chile.